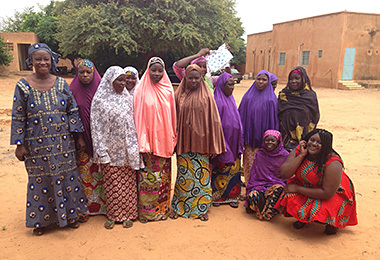 This project by Hadjaratou Gado ALzouma from UWC Mostar and Abdoul Nasser Bounia Yahya from UWC USA was developed to teach women from suburbs of Niamey in Nigeria the who suffer from obstetric fistula, how to sew African print dresses and sell these to the local people. Fistulous women come into a Government-designated centre in the capital city, where they get surgery in order to cure their disease. Usually, these women spend everything they have to afford the trip to the capital city from remote areas. After the surgery, they usually do not possess the financial means to get back to their home village. Moreover, some of the women do not heal after the first surgery, requiring them to make regular visits to the centre for check-ups, but do not possess the means to make such trips, jeopardizing their healing. A few years ago, independent NGOs opened a sewing studio in order to help the woman to make some income. However, over the years, the NGOs have cut the funding. 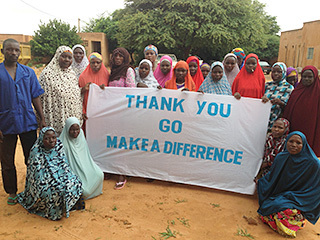 This GoMakeADifference project was developed to bring a small contribution towards improving the situation. The initial plan was to create workshops to teach women skills so that they could make a business out of sewing and raise much-needed funds. On arrival, we found the situation in the centre was much worse than we expected it to be. There was no funding and the sewing studio was barely running. Its existence was maintained by one brave woman who had decided to help the ill women on her own. The project team had to make some adjustments to the initial idea. Existing sewing machines were repaired, and the rest of the money was used to buy new machines for the women who already knew how to sew. 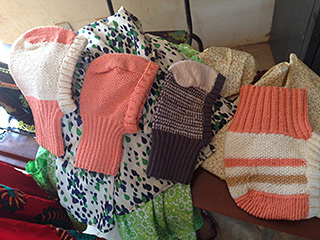 Through the project, some materials were purchased to enable the women to start businesses in their respective villages. This project made a difference by giving those women a prolonged source of income, by giving them the means and tools to be self-sufficient. Now they will be able, not only to generate money by themselves through sewing but, also teach other people in their villages how to sew and be self-sufficient. The enduring success of the project is that those women would most likely not go back to the centre as fustulous because, if they get pregnant again, they will have the means to go to a hospital and have a safe childbirth. The students took a great pride in providing something to these women in a way which will help to change their lives forever. They learned important lessons, that if they were to carry the same project out again, it would be better to work more closely with the officials of the centre and the administration level, not only the women. Niger is a country that faces numerous challenges. There are countless of these kind of centers where women need help and assistance. We were so proud and happy to contribute to alleviating the issue. We think that our initiative will have a significant impact in these women’s lives.